You are here: Home / Ent. / Film Review; Master Z: The Ip Man Legacy. Film Review; Master Z: The Ip Man Legacy. (ThyBlackMan.com) At first glimpse, this martial arts film is a tad disorientating. Nothing looks real. The footage looks like it was shot entirely on a soundstage. There are few to no exterior shots with actual sun or moonlight. But, if you acclimate yourself to this process, you can enjoy this curious production that sometimes feels like a play, a dance performance or an elaborate opera for people who block, chop, kick and punch. 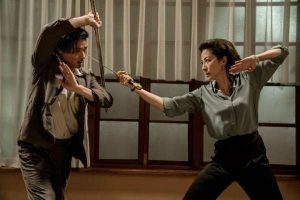 The plotline by screenwriters Edmond Wong and Tai-lee Chan (the Ip Mantrilogy) unfurls and their homage to Ip Man’s style is evidenced as a bounty of characters hits the screen. Rivalries, infernos, street fights and revenge attacks mount. Action scenes explode at the right intervals and are well-paced (editors Kai Pong Chow and Chi-Leung Kwong). Martial arts fans will eat it up, even if some of the stunts employ invisible wires to help the cast leap over opponents and climb buildings. The target audience won’t care one bit.